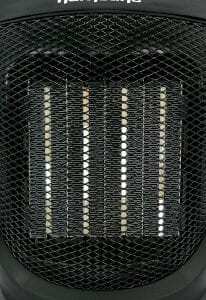 What Makes A Good Space Heater? Being on the road, either while camping or being a full time RV-er, is best when done in comfort. Unless you’re a snowbird and have the luxury of of relaxing in warm weather, chances are you’re going to encounter some cold times here and there. But rather than turning up the heat with every shiver, sometimes just resorting to a small space heater can get the job done. 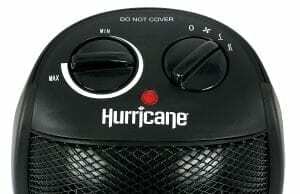 In this review, we’re going to take a look at some of the best space heaters for RVs and help you outline which is ideal. To ease your shopping experience, we’re going to go over the main features of each model, then discuss some pros and cons. The main features are aspects particular to each model, while the pros and cons are reports we’ve reviewed from recent buyers. Believe us when we say you won’t want to miss out on this. If you’re on the hunt for a new space heater, this one’s for you. Some say all space heaters are alike. While they do perform the same task, in fact, not all space heaters are the same. To help explain this a little more, we’re going to breakdown some popular types of space heaters. One of the most popular types of space heaters known by many are propane heaters. These models are ideal when it comes to keeping warm around a picnic table, or when there’s a lack of electricity. If you’re considering buying a propane heater, be sure to look for safety shut off features that will engage in the event of the heater accidentally being knocked over or coming into contact with low-oxygen. Known for their steady heat output and old school style warmth, oil-filled heaters are a great way to boost temperatures over a long period of time. While they do take a little bit longer to warm up, compared to other models, these are sure to do the job every time. 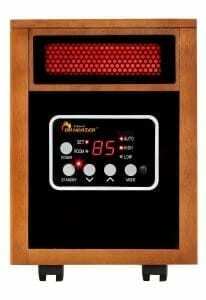 When someone say the word space heater, more often than not, they may be referring to infrared heaters. 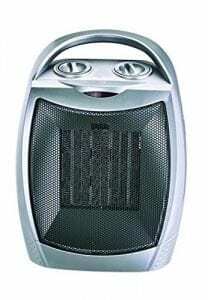 Commonly known as radiant space heaters, these are recognized for their ease of use and wide range of versatility. They are among the safest available for purchase and are great for heating up small areas. Place one of these next to your legs or on the ground near a table, and enjoy - just be sure not to place them too close, you may be caught off guard by how well they work. Due to their innovative design and excellent heat output, ceramic space heaters have grown to be a popular pick among shoppers. These space heaters heat the air, compared to the object they’re nearby, and do a great job of moving the warm air around the room. Due to this design, they are efficient and sure to put an end to any nippy occasions. User-friendly and compact, electric space heaters are ideal for RV enthusiasts. These ‘plug-and-play’ models are always up for the job, and are sure to turn any frosty evening into something warm and cozy. If you’ve been eyeing an electric space heater, be sure to think about its size relative to your RV, and never leave it on and unattended. When shopping for a new space heater, there are a few key aspects to keep in mind. Some may think price is priority, but that’s certainly not the case. Let’s discuss some of the top components that go into making a solid space heater. Yes, size matters. When reviewing models, it’s important to think ahead about the space you’ll be using this heater in and the output you may demand in the future. Buying a smaller model because it seems like an optimal choice, may not work out in the long-run. On the other hand, if you choose a model that’s too big, you may feel it’s a burden to haul around. Price isn’t the only thing that matters, but it does play into any shopping experience. We recommended staying within the limitations of your budget and securing a model that’s ideal for you and your bank account. We all hate buyer’s remorse, do your best to avoid being an enemy of guilt. Our goal of introducing the previous section before this, is to ensure you have all the information available to make a well-informed purchase.Think about the type of RV you have and how that may play into the type of space heater you choose. Do you have plans to use this heater outside your RV? Or is it meant to keep your legs warm when winter comes? Thinking about questions like this in advance can help narrow down the type of space heater that’s ideal for your lifestyle and needs. Now we’re going to move onto the review portion of our article and highlight some of the best space heaters for RVs. Within this section, we’re going to cover the main features of each model, then discuss the top pros and cons according to recent buyers. The last model on our list, and our top pick for the best space heaters for RVs, is the Mr. Heater F232000 MH9BX Buddy. This propane model is easy to hookup and easy to travel with. Most important, there are two heat settings and a large porcelain heating dish built within to direct heat outward. When it comes to hooking up fuel, this heater is designed with a swivel regulator to ease any headaches that may arise. To ensure no mishaps occur while in use, this unit comes equipped with tip-over and low-oxygen safety shut off features to protect against accidents. When you’re done using it, just fold down the handle and tuck it away in any storage compartment. Easy as that. 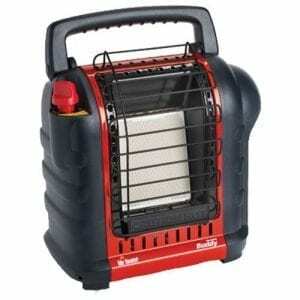 The Mr. Heater F232000 MH9BX Buddy measures 14.17” x 8.97” x 14.37” and weighs only 9.5 lbs. If you’re looking for something a little big larger, you can even upgrade to the Mr. Heater F274830 MH18BRV Big Buddy. After reading what people say about their experience of the Buddy model, be sure to watch the video below that explains this model more in-depth. Overall, there’s no doubt the Mr. Heater F232000 MH9BX Buddy made our top pick for the best space heater for your RV. This model is safe, reliable, and very user-friendly. Not only is it backed by a 3-year warranty, but it’s durable and fuel efficient. 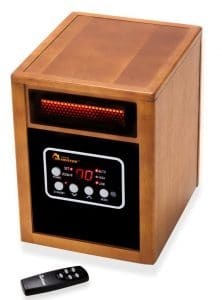 The next model on our agenda is the Dr Infrared Heater Portable Space Heater. This 1500-watt infrared model weighs 24 lbs and is the perfect addition to your RV. It features tip-over and overheat safety protection, and is designed to heat with ease. Its energy efficiency ensures you can stay warm and not have to worry about large heating bills. 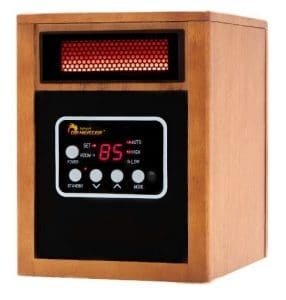 The Dr Infrared Space Heater comes with three power settings: auto, 1000-watts (low), and 1500-watts (high), and features a digital display to easily dial in temperatures ranging from 50F to 86F. Additionally, the dual heating system works to spread air evenly via the 7” blower wherever it’s placed. Due to this design, buyer’s don’t have to worry about a noisy, obnoxious fan, as with other models. On top of everything, the heater’s built to withstand upwards of 80,000 hours of use and is backed by an excellent 3-year warranty. Fan turns on and off every few minutes to monitor room temperature. A few buyer’s report this to be a little annoying, since it’s not 100% infrared. Some buyers mention they feel the panel wood isn’t the best quality, but this doesn’t take away from the performance of the space heater - strictly cosmetic. The bottom line with the Dr Infrared Heater Portable Space Heater is that this is a top of line infrared model, perfect for your RV lifestyle. The dual motor design effortlessly outperforms other low-end models and ensures you stay warm when you need to most. Those who have experienced this model first hand have nothing but good things to report. Many say that its functionality and ease of use helps set it apart from competing models. Additionally, users can expect to be granted magnificent control over heat is adjusted and controlled. 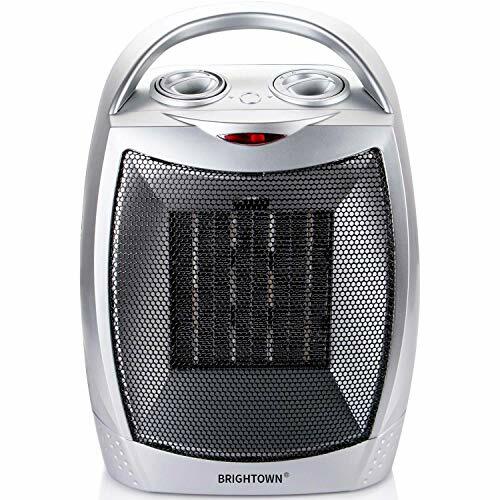 The first space heater on our list is the Brightown 750W/1500W ETL Listed Quiet Ceramic Space Heater. This model comes in a variety of colors and is sure to keep you warm and cozy when you need it most. It features a safety shut off in the event of the unit overheating, and is designed to be efficient and quiet on low settings. This model also has the ability to change between three settings: 750-watt, 1500-watt, and normal cool blow fan. Because dampness and humidity may cause the heating element to errode, we encourage you to keep this space heater away from wet locations. Should anything happen though, keep in mind its protected by a 1-year quality guarantee. 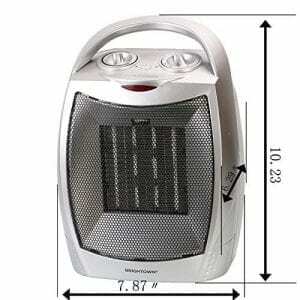 Small and compact - measures 6.2" X 7" x 9.2"
When it comes down to the Brightown Ceramic Space Heater, the bottom line is that this model performs exactly as users expect and at a great, affordable cost. 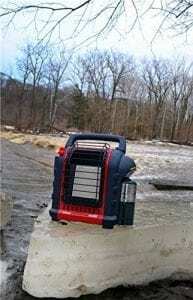 The lightweight design ensures you can easily travel with the heater and move it from space to space. While a few people report that it’s not as quiet as they would have hoped, the heat output and oscillating fan are a great benefit that make up for the noise. 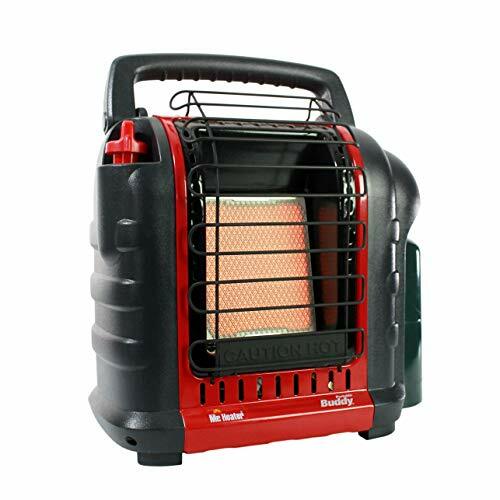 The Caframo Limited 9206CABBX True North Heater is the ideal little addition to your RV during those cold winter months. One of the great benefits to this particular heater is that it features innovative technology to protect against severe internal temperatures (below 38F). Buyers have the ability to change between three heat settings: low (600-watts), medium (900-watts) and high (1500-watts), as well as two fan speeds. While this space heater does require electricity, once plugged in, buyers can utilize the automatic thermostat controls and relax in comfort. This model is also CSA approved and comes with a limited 5-year warranty from Caframo. Let’s see what people had to say about their experience while using this space heater. leek design allows it to be placed in a variety of places. People love the fact that it can easily slip under their seats. Due to its size, this may not heat your entire RV. The design is more for direct personal heat. The bottom line with the Caframo Limited 9206CABBX True North Heater is that this is an excellent model for storing in tight places and keeping your personal area warm and cozy. Most people admire the fact that it can easily be kept under any chair while driving, or kept on their dashboard. The only drawback to this model we found is the fact that it may not heat your entire RV, especially larger class A models. Although, this is perfect for keeping nearby and staying warm while eating, playing games, or relaxing with a good book. Another fan favorite - pun intended - is the Hurricane Ceramic Heat Wave Portable Heater. This 9” model comes with three adjustable settings and features an easy to use, adjustable thermostat. 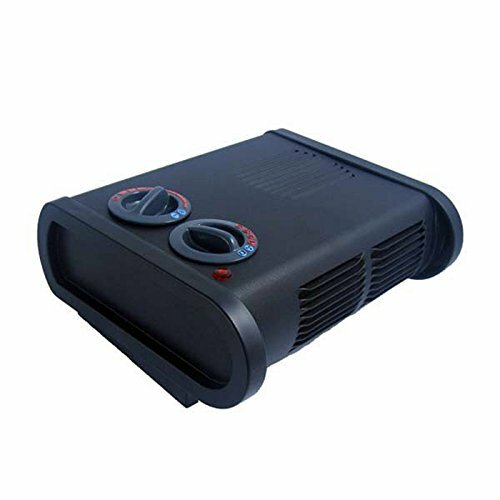 From this design, users have more control over the 1500-watts of power offered by this quiet, compact space heater. 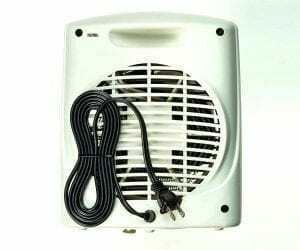 Perfect for inside and out of your RV, this heater is powered by a 2-prong electrical plug in and is the perfect way to keep warm once the sun goes down. 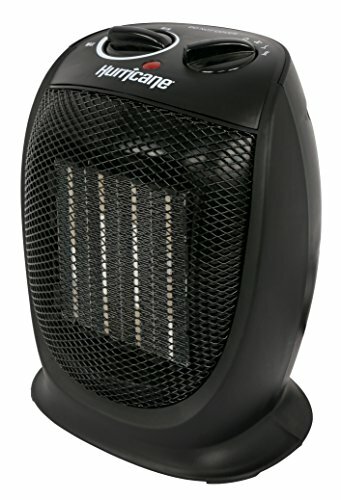 Backed by a 1-year warranty, this heater is great for traveling with and can withstand any active lifestyle. May not heat entire RV due to size; model is intended for personal space heating. The Hurricane Ceramic Heater is an excellent model when it comes to staying cozy at the table or while relaxing in your favorite space. While it may not produce enough heat to carry air all throughout your RV, this little model is the perfect addition during those winter months. Small enough to tuck away in between uses, buyer’s love the fact that it does exactly as intended everytime and never underperforms. When it’s all said and done, and you’re in desperate need of warmth, you need a model that’s going to deliver and keep you comfortable. There’s nothing worse than being miserable and cold. 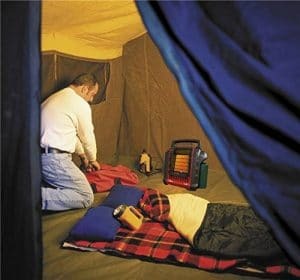 Luckily, all the space heaters mentioned are sure to help alleviate any shivers and unbearable experiences. 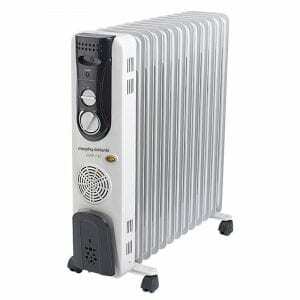 As previously mentioned, our top pick among the models mentioned is the Mr. Heater F232000 MH9BX Buddy. If you’re looking for something just a little bit bigger, be sure to upgrade to the Big Buddy. We hope this review has been beneficial in helping you narrow down which space heater is best for your RV. If you end up choosing a model from our list, please be sure to come back after giving it a go and let us know how it worked out. Stay warm everyone! For more information regarding RV products check out our friends over at RV Expertise!